I love birria, and of course being something that's actually Mexican, you can't get it at the Mexican restaurants in my area. 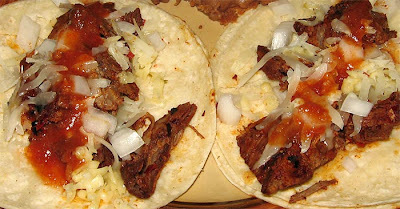 I did have a good birria taco at a place in Jamaica Plains, Boston, but that's been it. So I turned to Rick Bayless and followed his recipe, using a lamb leg. Flavor turned out an A, the meat itself ended up a bit dry - next time I'll use a fattier piece of meat. I marinated the lamb overnight in a chile guajillo sauce, then steamed it in the oven for 3 hours the next day. Made delicious, rich tacos.